This Offer includes a set (one each) of both Quarter and Loonie Cart Keys. Shipping is Free within Canada. 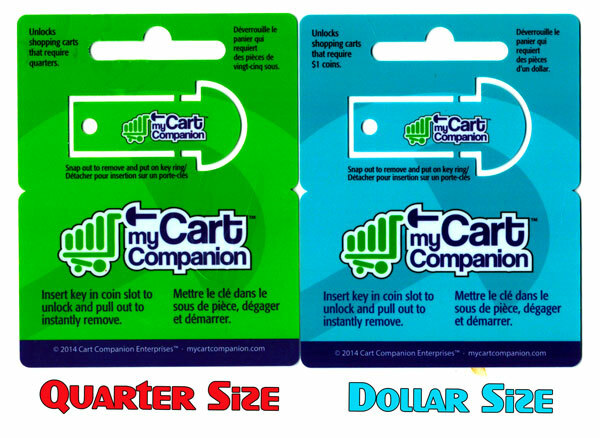 My Cart Companion Promotion - One Set of Shopping Cart Keys/Tokens My Cart Companion is a simple, convenient solution for people who shop where coins are required to release shopping carts. All to often we don't have correct change, we are in a hurry and just want a buggy! My Cart Companion fits on your key ring so you always have it handy. Insert. Unlock. Remove. Fully protected by Canadian Patent #2,815,061 Cart Companions™ are akin to a key that is housed within a plastic card that one simply removes and affixes to their key ring. This key mimics a coin or token when one goes shopping and requires the use of a locked shopping cart or Hospital wheelchair. The need of a coin that you don’t have compounded by the need to seek change from a passer-by or have to wait until the cashier completes a sale in order to get one just so you can go shopping gave birth to the item. Insert. Unlock. Remove. The user simply inserts the key, unlocks the mechanism and removes the key. There is no need to leave the key in the device. Note: this key is designed to operate in deposit-themed devices where the coin or token is returned and will not operate in any device that retains the coin. Please be considerate an either return your cart or give it to a person who needs it. This item is backed by a money back guarantee but we know you'll love it. An ideal Stocking Stuffer or year round gift.